1. When I was probably only 3 years old my grandma took me to her friend's farm, where I got to ride a big white gelding named Casper. He is the biggest sweetheart and toted me around. I would get to see Casper every couple of years after that and he will always have a place in my heart. 2. I love to read and so would devour any and all books involving horses. 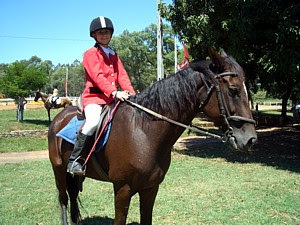 When I was in middle school, my family was living in Paraguay (South America) and for the first time in my life I was able to take riding lessons. One of my parent's friends rode and he would take me and his daughter with him to riding lessons 1-2 times a week. I rode two mares named Penelope and Cleopatra and those horses taught me the basics of riding. 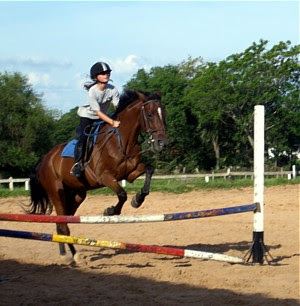 By the end of my riding time at that barn I was jumping 3 ft and was competing in the local Paraguayan show circuit. Right before I went into 10th grade my family moved again. We country-hopped to places that didn't have access to horses and so I wasn't able to ride again until I was in college. College gave me the chance to incorporate horses into my life once again. I found a teeny tiny barn and was able to get a working student type deal. I would clean the barn one day a week and in exchange I essentially had a full lease on a Quarter Horse mare named Molly. That barn was a great opportunity, because I had so much fun with Molly, but it was very unstructured and so after about a year and a half I started looking for a new barn. In 2014 I found my current barn. It is a hunter/jumper barn with a little bit of dressage thrown in as well. It is an awesome place with great facilities (like both an indoor and an outdoor arena) and great people. I was a working student there for a year, and in 2015 started working as an assistant instructor, teaching beginner riding lessons to kids. In August 2016 I bought my first horse, Casey. Currently we are working on our jump training and have been regularly schooling 2'6"-2'9" jumps, We have plans to begin showing in Jumpers in the spring and summer (probably at the 2' level, but maybe 2'6" and 2'9" if it goes well). I am still working as an assistant instructor as my weekend job and work as a teacher as my weekday job.